I have chided the Worlds' Finest comic almost monthly, so much in fact that I have started to wonder if I should continue reading the book. 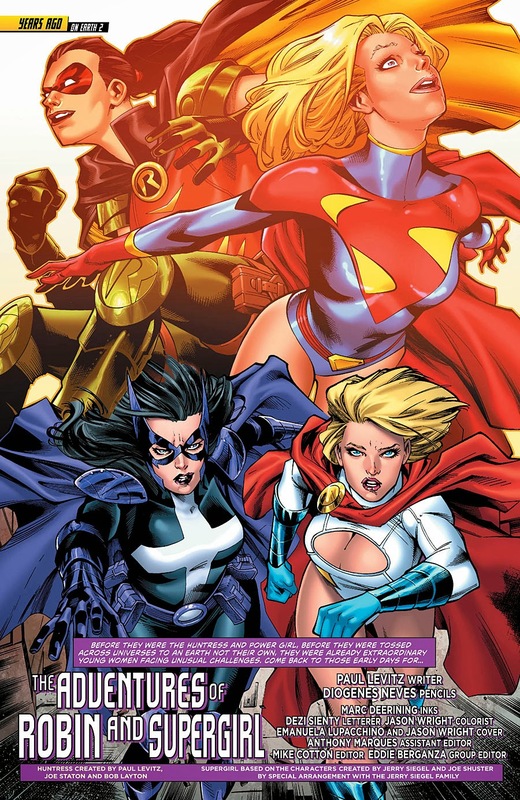 It is some sort of loyalty to the historic characters of Huntress and Power Girl, as well as the revelation of Power Girl having been the E2 Supergirl that has kept me coming back. One part of this book that hadn't let me down were the flashbacks to Earth 2 when the characters operated as Robin and Supergirl. There was something more classic about the characterization there, especially with Kara. I was, therefore, looking forward to Worlds' Finest Annual #1 which came out this week. It is a called a prelude to the First Contact arc where Huntress and Power Girl meet the Prime Earth doppelgangers of their E2 mentors. That meant an entire annual of the adventures of Robin and Supergirl. Writer Paul Levitz continues his unprecedented streak of writing books which are fine. I desperately want to love this book and, like other issues, there a pieces of this Annual which I very much love. But those moments are mixed with off characterization and a feeling of inertia. In particular, there are parts of Kara's story that are cringe worthy. Diogenes Neves handles the art and brings a nice kinetic feeling to the action scenes. I have always liked Neves work whether it is Demon Knights, or Supergirl, or here, his art has a nice feel of both precise and rough. I wish I could describe it better ... but it works. I just thought I would post the opening splash page. I always like this sort of set-up of a comic page. We have a crisp action shot of Huntress and Power Girl in the foreground. The art here by Neves feels like current Worlds' Finest artist RB Silva which gives the book a feeling of continuity. But in the background, in more muted tones, we look into the past. The costumes are different. But the feel of the characters is different too. Robin is smiling. Supergirl is looking upwards, optimistic, arms open. It shows where these characters were and where they are now. The book is split into three chapters. We have a Robin story, a Supergirl story, and then one where the two characters team-up. One of my problems with the title is that Levitz seems to have a hard time writing a story where the two main characters are working together. He often has them separate which diminishes the draw of this book. The opening chapter has Robin and Batman heading to a high end brothel in Gotham, hoping to get some closure on Catwoman's death. We witnessed Catwoman's death way back in Worlds' Finest #0. There is some fine give and take between Helena and Bruce as he sits back a bit and watches her pound her way through the bad guys while giving her some tips. The battle takes the two heroes into the catacombs of the place where Robin takes out all the men who have basically enslaved the prostitutes. Now call me old fashioned but I don't know if I want to see Helena Wayne kill someone. 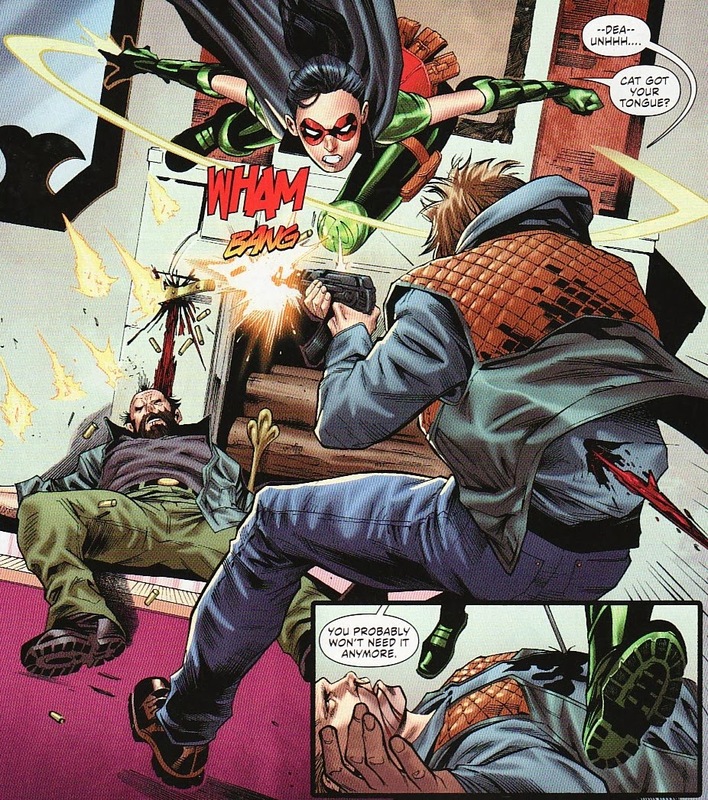 Here she is, a teen, skewering a criminal with a fireplace poker. While we don't hear it implicitly, this looks like a lethal wound. Did she just kill this man? Now I was much more willing to accept a more murderous inclination in Helena Bertinelli given her history. And even then I wasn't happy. I was glad when Batman chastised her about those actions. But this is Helena Wayne. She carries the weight of that name. And she should be above this. So overall ... some good and some bad in this chapter. The Supergirl chapter is a true mishmash of just about every odd corner of the Supergirl mythos. I think Levitz really struggles with her character. 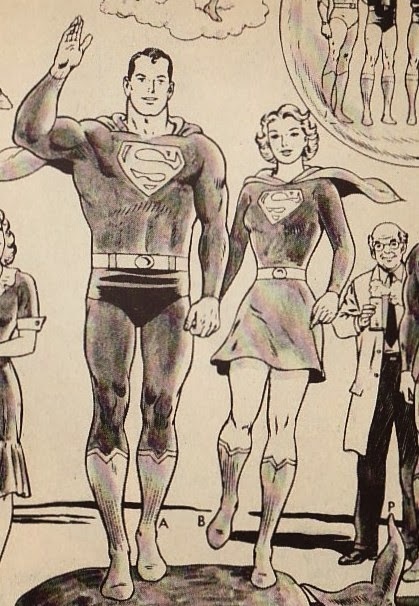 I think he wants her to have the innocence and optimism of the Silver Age Supergirl. 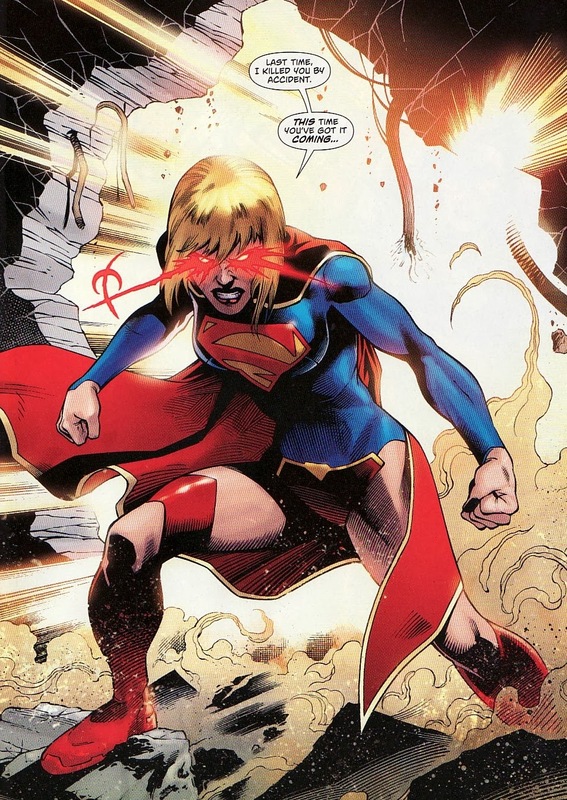 So the Earth 2 Kara is trained by Superman and is a 'secret weapon', all of which smacks of the earliest storylines. And this opening panel of a young Supergirl, crying, surrounded by child-like things like a teddy bear and a fuzzy pillow, really feels like early stories ... and not in a good way. She is crying because something bad has happened and she feels responsible. But an innocent Kara in Silver Age mode doesn't jibe with what people want out of Power Girl. Power Girl is supposed to be strong, brusque, fiery and feisty, opinionated, and proud. I don't know if I have felt a true Power Girl vibe at any point in this title. Instead Levitz thinks the best way to show a Power Girl personality is to have her be a party girl and sexually voracious. I wouldn't mind her being independent and confident in that way if it was an aspect of her personality. But Levitz has it simply dominate. So in the story, Levitz has Kara 'sneak out' and head to a New York bar. Again, this is a young Kara, a teenager, sneaking into a bar, drinking, and dancing the night away. I wouldn't mind this as a sign of an adolescent exploring her freedoms except this aspect of looking for the next man (in this case, the first) has become the one personality trait that Levitz keeps hammering. Not so Sliver Age Supergirl innocent. But not 'Power Girl-ish' either. At the bar, Kara meets a Barbie-doll like boy called (ironically) Ken. The two become instantly smitten. Kara shares a kiss under the moonlight, feeling the exciting rush of first love. 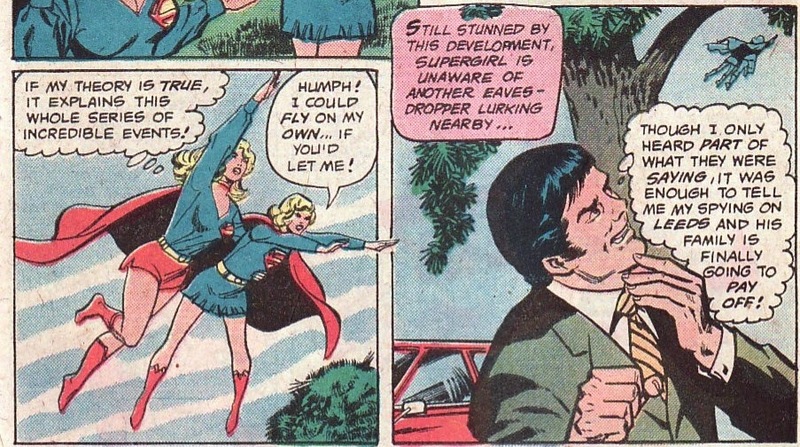 That really sounds like a seventies Supergirl story, not the kind I necessarily embrace. Turns out that New York is hosting a World Government meeting that night and Ken is the son of the Gammoran consulate. The WorldGov center suddenly explodes, the building being torn apart from the top down. 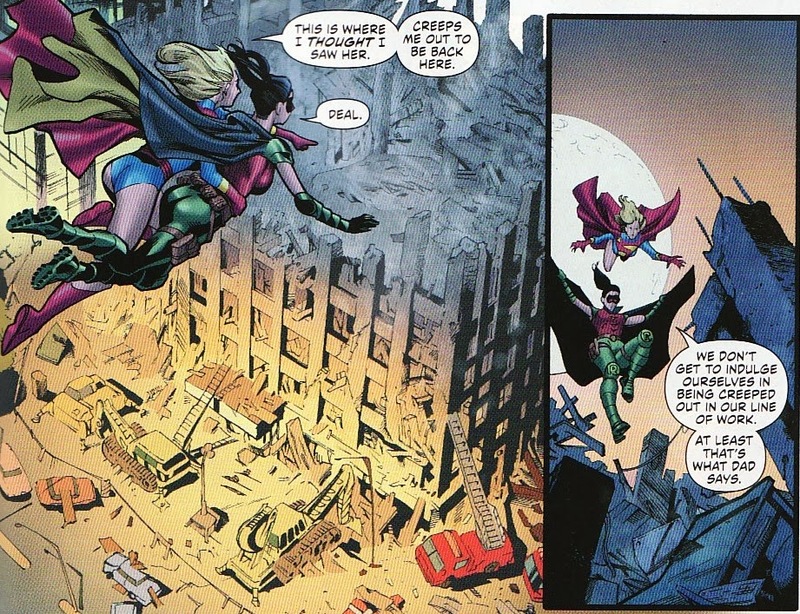 Kara slips off and changes into her Supergirl costume, trying to save who she can by managing the falling debris. Unfortunately, Ken thinking Kara is in danger goes looking for her and dies. It is a tragedy and Kara blames herself. Had she not been there, Ken would not be looking for her, and would not have died. Well, that really feels like a Silver Age Supergirl romance where her boyfriends were either bad guys, magic horses, or dead by the end of the issue. 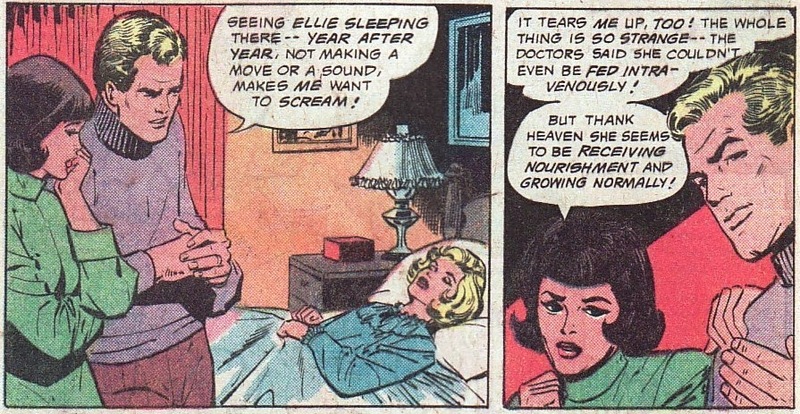 That said, I don't know how guilt and early tragedy is a good motivation for Power Girl. Shades of Crisis on Infinite Earths #7 in this panel. Kara spied a super-being in the building and calls upon Helena to help track down the villain. Finally, we get to see the two characters together. And one thing that I like is the interplay here. We have that feel of innocence in Supergirl as she nears the blast site. And I love how Helena channels her father, bringing his wisdom into the mix. But my favorite part of this last chapter is seeing Superman and Batman discuss how their charges are growing up, rebelling, and becoming their own person. This Batman has never felt like he has some control over his daughter. And he knows Supergirl wasn't going to stay in hiding forever. I wonder if this is the hook for First Contact. Maybe this Batman didn't put limits on his daughter thinking it futile. 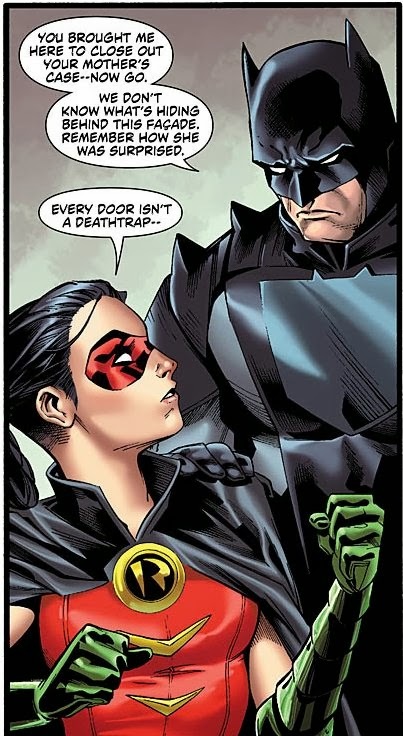 Maybe the Prime Earth Batman will feel different, will demand Helena not kill, will hold her to that higher standard. That would be good storytelling fodder. And this Superman thinking that Supergirl will just march along like a good soldier sounds like the Superman in those old Action Comics stories. 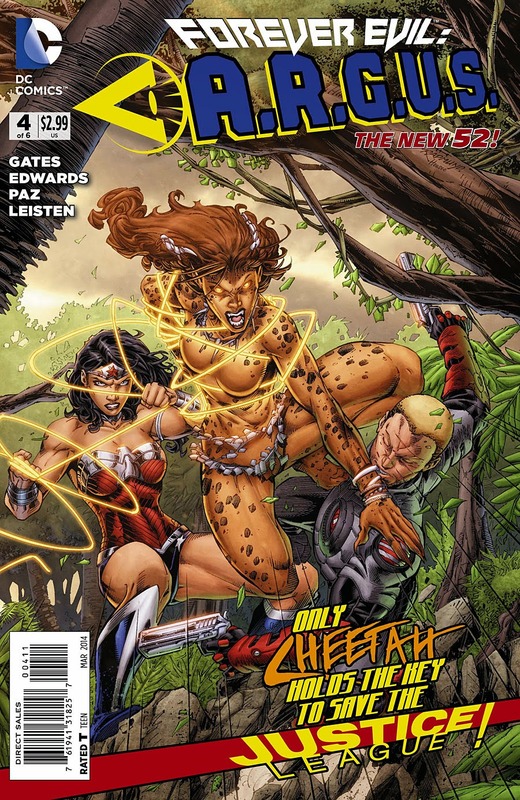 The investigation leads them into a battle with the Earth 2 Fury. Initially they brawl at the WorldGov site. Fury escapes to the mountains and Worlds' Finest duo track her down. During the fight, we see a smidgen of the old Power Girl fighting spirit. She screams she is the strongest. She won't back down. And here in the mountains, she proudly shouts her credentials ... she is Kara from Krypton. If only she followed it up with 'I don't scare easily' instead of 'I am royally pissed off'. I would be just fine if the 'pissed off' phrase was never used in conjunction with Supergirl again. Very nice art here by Neves. Fantastic action shots. And I talk about Supergirl being a hero on a journey, sometimes doing the wrong thing when trying to do the right thing. Here, Wonder Woman shows up to try to get her 'daughter' but Supergirl isn't going to be denied her ... I guess revenge is the best word for it. And so, in order to get to Fury she has to get through Wonder Woman. So she punches Diana. 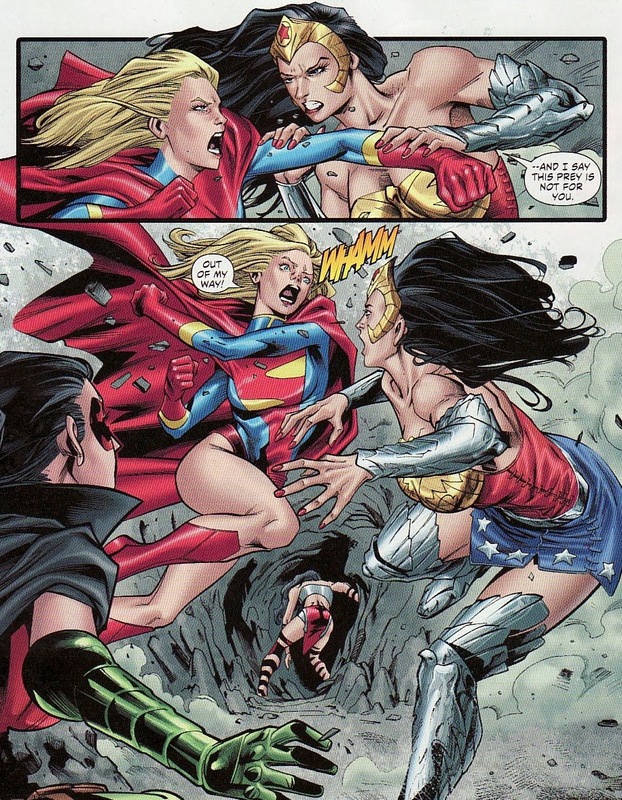 I have seen Supergirl punch Superman, Superboy, Dr. Light, Martian Manhunter, and many others. This actually felt right. This Supergirl is just starting the life of a hero. This lapse in judgment could happen. Again the art sparkles. So some nice moments. And some odd moments. Sounds like Worlds' Finest. I will say the overall feeling for this issue was better than most. I especially liked hearing the thoughts of this world's Batman and Superman. It will be interesting to contrast those thoughts to the Prime Earth counterparts' thoughts. There is some good stories here to mine. Forever Evil ARGUS - Psi! While Forever Evil as a crossover event hasn't really grabbed me, the Forever Evil A.R.G.U.S. mini-series has been a wonderful little offshoot, highly entertaining. I will admit that I only picked up the book when I saw writer Sterling Gates was on board. I have rarely (I don't thin ever) been disappointed with Gates' books. Between reading Suicide Squad, Vibe, and Justice League, I felt like I knew enough about ARGUS and the internal workings of these secret agencies in the DCU. So far I haven't been disappointed. Steve Trevor has really shined here. And I really like the new more tragic Killer Frost. This book has really read more like the Ostrander Suicide Squad. These are a mix of characters with a mix of motivations but all working towards a good goal. This book really makes me think that Gates would shine on a team book. And god knows DC has a bunch of teams on the shelf or about to be canceled. I'd love to see Gates' on a Checkmate style book. Oh my god ... it's Psi! A new Psi ... but Psi nonetheless. 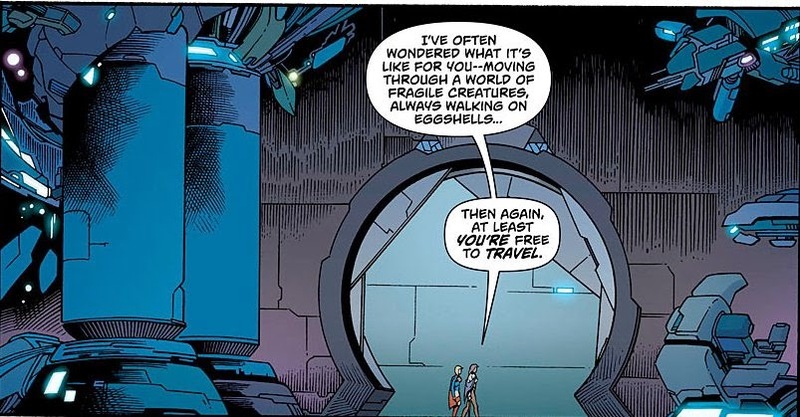 One thing I appreciate about Gates is his ability to take some of the lesser known DC characters and bring them back, even as an Easter Egg. So we saw BizarroGirl, Reactron, Satan Girl, and Superwoman in new incarnations in Supergirl. We just got the new Killer Frost. And in Vibe we saw a new Gypsy as well as all the crazy inmates in the Circus. So while not surprised to see Gates bring back a little known Supergirl villain in theory, I am surprised to see Psi again. And this one looks downright bizarre, mouthless, metallic, other-dimensionally. At first I thought she looked Cronenberg-y. But now I think she is more like a Clive Barker character. And there is a whiff of evil in her, or an out of control nature. She grabs Steve Trevor and sort of assaults his mind. 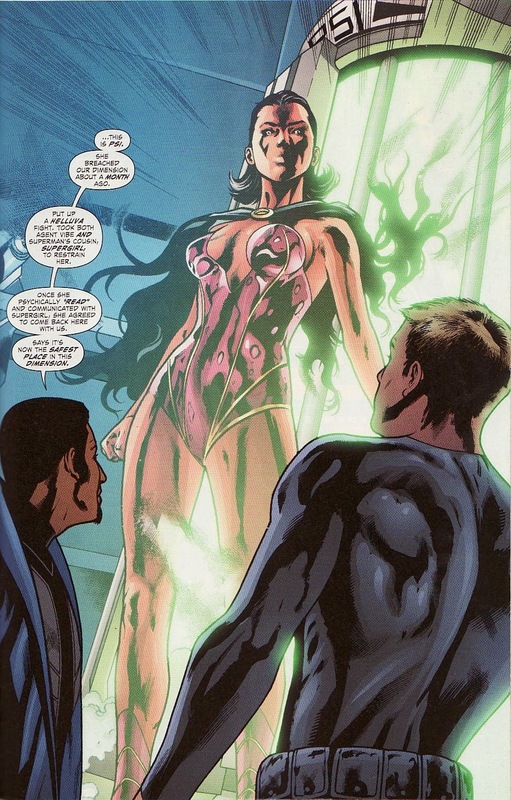 Moreover Gates has Steve Trevor talk about when Psi first breached into the DCU she was stopped by Vibe and ... Supergirl!! An untold tale of Vibe and Supergirl, a heroic Supergirl who helped Psi get help from ARGUS. There is an mysterious and unseen Green Man, a long-time ARGUS agent who I am guessing is the Spectre. And then Gates calls the prison tubes in ARGUS Draper tubes, a nice Easter Egg nod to Moosie Draper, the Master Jailer. Awesome sauce! But back to Psi, the real focus of this post. If you re-introduce a Supergirl character to the current DCU, you know I am going to have to showcase them. So in the first of several looks back at the little known character Psi, I present her entry in the 1986 Who's Who book. The history section will review her story as seen in Daring New Adventures of Supergirl 1-3, but don't worry, I'll cover them in detail. (In fact I have already reviewed Daring New #1 and, as a result, Psi here.) Suffice it to say, Psi had tremendous psionic power, enough to floor Supergirl when they tussled. The art here is by comic legends Carmine Infantino and Bob Oksner, both of whom were nearing the end of their creative years. While I like the oversized flowing black cape/cloak, the rest of this costume is pretty ugly and silly. Expect a couple more looks back on Psi over the next couple of weeks! And thanks to Sterling Gates for bringing back a Supergirl rogue. Would love to have Tony Bedard bring her over to the main title. It has been a while since I came up with a Back Issue theme to review here at Comic Box and then I was struck by the muse. You see, as I was reviewing the last issue of Supergirl I kept getting this vibe that Supergirl was really as angry at herself as she was towards the rest of the universe. She could have done a lot in her time to be less isolated and to acclimate more. She could have relied on family and friends to help her with her grief. But instead she seemed to be hurting herself by staying distant and things have festered until finally it seems they are going to explode. 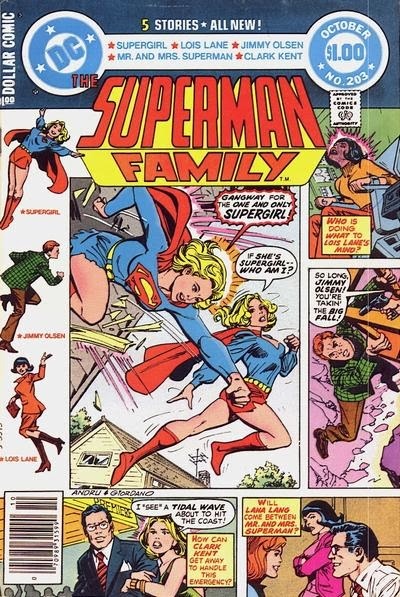 That concept of Supergirl hurting herself made me think about past times where Supergirl has met Supergirl, maybe even fought her.. And so here is the first entry in the four part back issue series of Supergirl confronting Supergirl - Superman Family #203, published way back in late 1980. 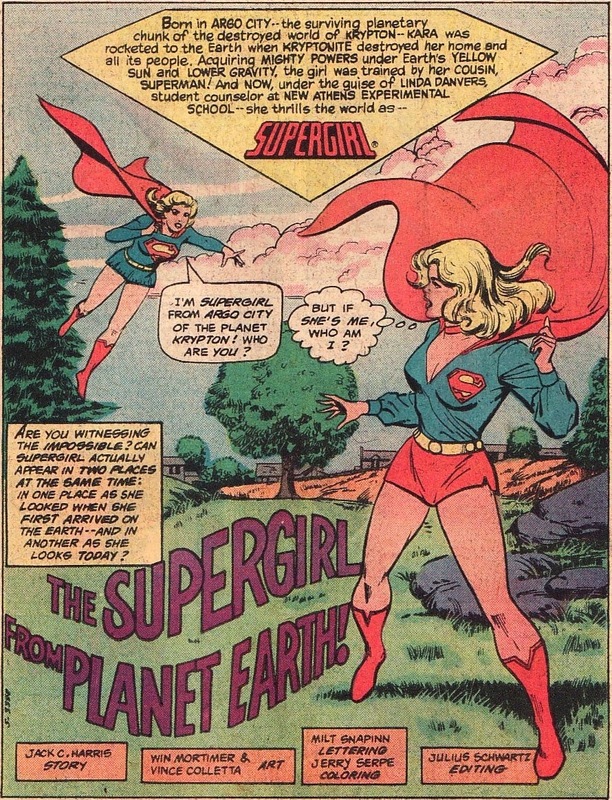 "The Supergirl from Planet Earth" was written by Jack C. Harris with art by Win Mortimer and Vince Colletta, the predominant Supergirl team on this book. This was the 'guidance counselor at the New Athens Experimental School' time period for Linda Danvers, a time between stints as a journalist and a soap opera actress. These stories are for the most part forgettable. Not many of these made a major impact on the Supergirl character. 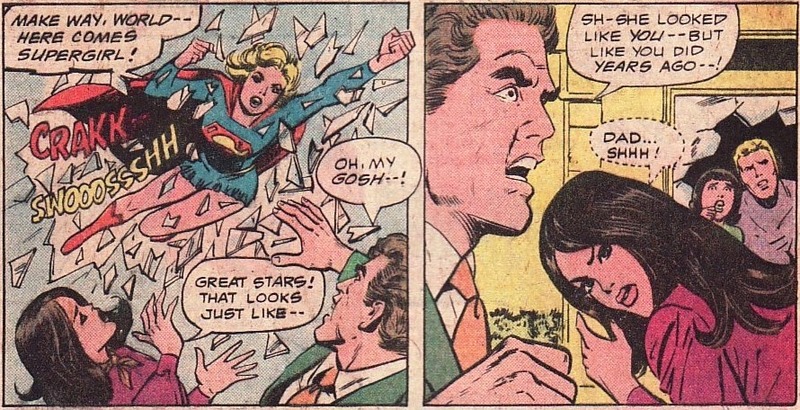 And while this is a more seasoned Supergirl her adventures rarely carry the gravitas of Superman's. 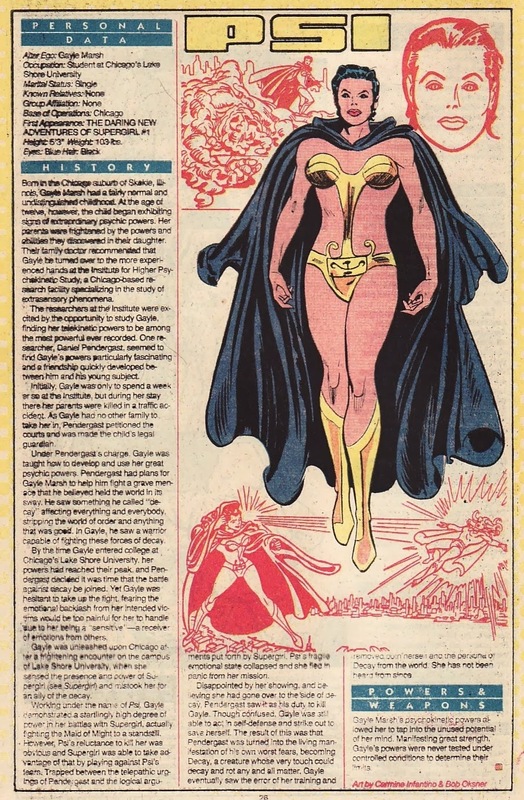 Still, the writers did their best to inject some Supergirl history into the proceedings including bringing back Lesla Lar, Lena Thorul, and a surprise plot twist (even if a bit wonky continuity-wise) in this story. There is a sort of easy charm to these stories as you read of a Supergirl ready to be a hero and dealing with ordinary life. We should be glad that the creators kept the Supergirl character moving forward and in the spotlight enough that Paul Kupperberg's Daring New Adventures is just a couple of years away. Nice opening splash page here again showing the younger and older Supergirl facing each other. What does it all mean? Let's find out. The story starts in Midvale, in the home of the Leeds' Family. Mr. and Mrs. Leeds lament the fact that their young daughter Ellie has been in a coma for seven years. And, strangely enough, despite being comatose, she is growing normally and healthily. How can that be without nourishment? And the doctors are flummoxed. They could not even find a way to feed Ellie intravenously. It just so happens that Supergirl has decided to take a day off from her life in New Athens Florida and thought revisiting Midvale might be a good way to clear some cobwebs from her mind. As usual, Linda was having some romance problems that decided she needed some space. She revisits the spot where she actually crash landed years earlier. Amazingly, at the same time, Ellie wakes up from her coma and somehow exhibits super-powers, looking right through the wall and seeing Supergirl. Linda manages to run into her father as he is heading to work as a scientist at S.T.A.R. Labs. She explains that this Midvale trip was spur of the moment and she'd love to join him for the day. It turns out that Mr. Leeds works at S.T.A.R. with Fred Danvers and they car pool. As the car pulls up, Ellie crashes out of the wall crying 'Make way world -- here comes Supergirl!' She is wearing a classic Silver Age Supergirl costume and flies off. I love how Fred is so flabbergasted that he almost blows Linda's secret identity. 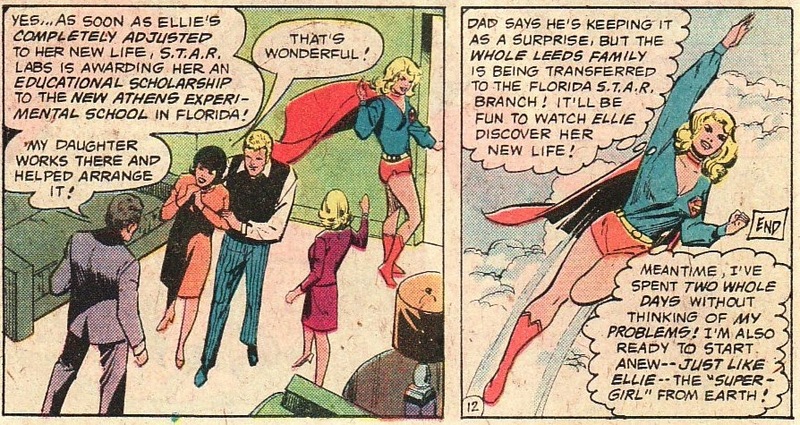 And this lookalike plot is certainly a well-traveled Supergirl road as just about everybody was indistinguishable from Linda in the old Action stories - from Lesla to Lena to any number of starlets. The Leeds are able to fill in some information. Ellie awoke, made a Supergirl costume at super-speed out of curtains in the house and took off. Linda leaves to 'look for help' and switches to Supergirl herself, catching up to Ellie just as the young 'Supergirl' loses her ability to fly. And then, oddly, Ellie says she is Supergirl and then recites chapter and verse of Supergirl's origin - the explosion of Krypton, Argo City surviving, the ground becoming Kryptonite, and Zor-El rocketing her away. So ... is Ellie really Supergirl?? Amazingly, Kara has a theory explaining everything - the coma, Ellie's belief she is Supergirl, and her apparent loss of all powers. I have to admit, I didn't have any theories when I first read this story. We'll get to the answer ... and my problem with it as a continuity geek ... in a second. Because the origin story and Ellie's powers have been overheard by an industrial spy sent to observe the Leeds and rob the Midvale S.T.A.R. Ah, the joys of fate in Bronze Age DC Comics. Of course Ellie's coma would end on the day that Supergirl was visiting and they would visit a site where an industrial spy can overhear their conversation. What if Linda visited the following day? 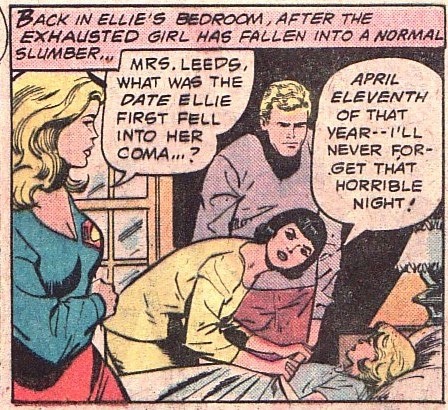 Well it turns out that Ellie fell into her coma on April 11th 7 years earlier, the exact day that Supergirl crash landed on Earth. So ... April 11th, Supergirl lands on Earth. And we all assume that Kara was around 15 years old when she crashed, meaning Kara is around 22 years old in this story. Supergirl surmises that Ellie heard the crash and went to investigate, witnessing Supergirl telling her origin to Superman as she did in Action Comics #252. And then the twist. Ellie also must have stumbled upon a piece of X-Kryptonite at the site and brought it home. Indeed, Supergirl discovers it in a box on Ellie's nightstand. So to further the premise, Supergirl states that X-Kryptonite can give Earth beings super-powers as long as they remain near it (it is how Streaky got his powers, and only when he went near X-K did he get re-powered up). The recently empowered Ellie couldn't deal with the sudden surge and went into a coma. And with the X-K nearby she used yellow sun rays to nourish and grow. That's why the coma didn't effect her that way. It also explains why MDs couldn't put an IV in here ... she was invulnerable. And it explains why Ellie lost her powers outside the home. She wasn't near the X-K any more. 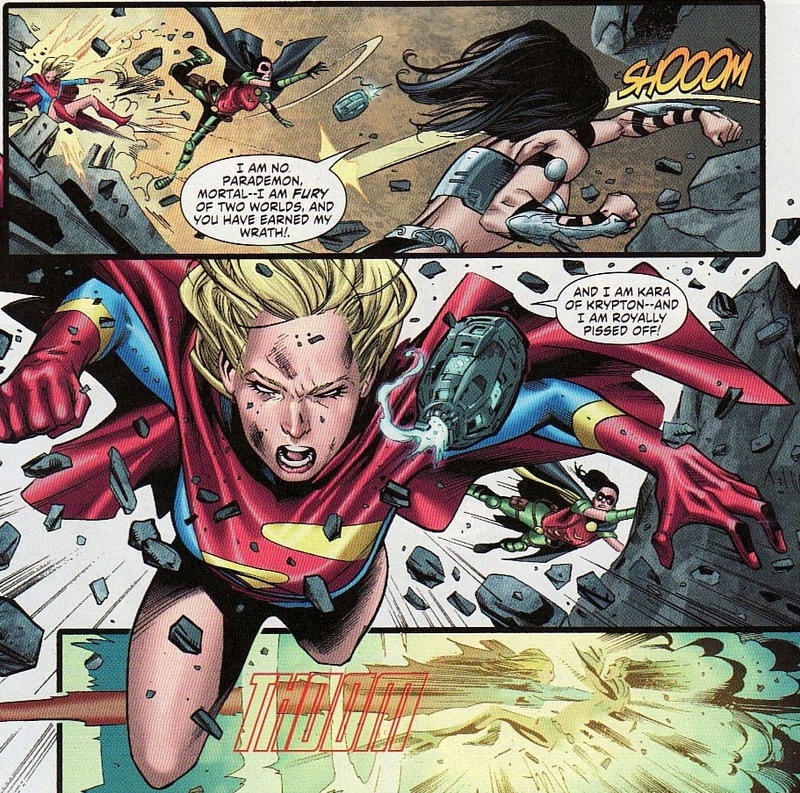 The X-K weakens Supergirl until it is placed in lead. Okay ... let's slow down ... because this is taking continuity a little off the rails. X-Kryptonite isn't a natural isotope of Kryptonite. It was accidentally created by Supergirl when she did chemical experiments on Green K in Action Comics #261. So Ellie shouldn't have been able to find a slice at the crash site. And X-Kryptonite doesn't hurt Kryptonians the way Green K does. So nice try to link some Supergirl mythos into the story. But Harris got it all wrong. And all this doesn't explain why Ellie thought she was Supergirl on awakening. 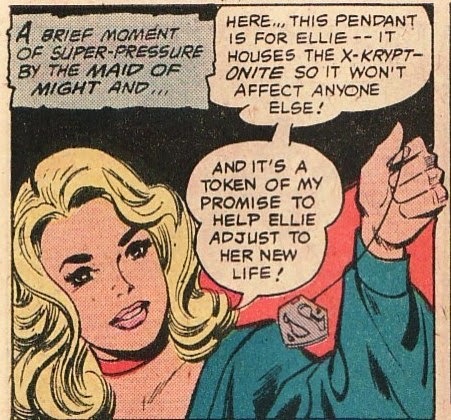 To welcome Ellie into her new awake life, Supergirl molds the lead around the X-Kryptonite into a S-shield pendant. Nice panel by Mortimer. And a nice gesture by a Supergirl who wants to help people. Of course, we need a throw down. 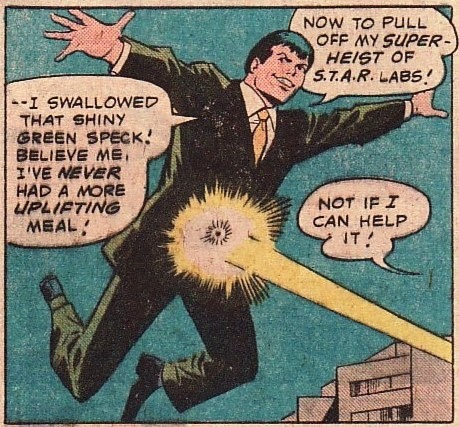 The industrial spy ingests the X-K so he will always be near the X-K and goes on a super-powered heist of STAR labs. He does know that eventually he'll defecate this and need to retrieve it ... right? There is a brief skirmish where the villain tries to use his powers only to have them fail. And then suddenly even his flight depowers. 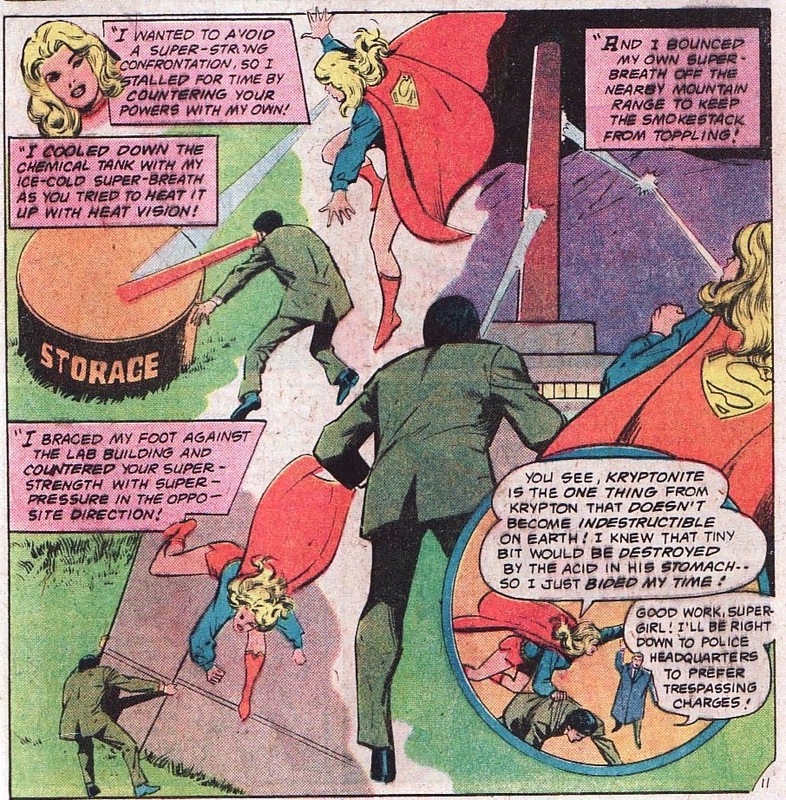 In a nice montage panel, we see that Supergirl was buying time, frustrating the man by countering his super-powered attacks with super-powered deflections of her own. And after a while, the man's stomach acid destroyed the X-K, completely depowering him. It is interesting that Kryptonite is the only Kryptonian relic that isn't invulnerable. 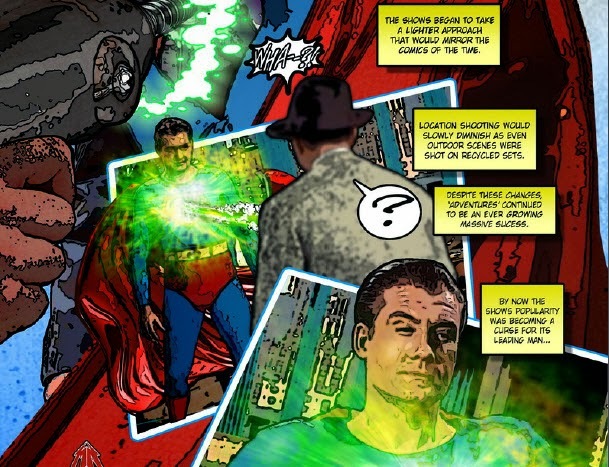 There have been plenty of stories where Kryptonite has been melted by acid, heat, or other chemicals. So pretty smart of Supergirl to realize that this was going to be a brief stint with powers by the crook. With the X-Kryptonite destroyed and Ellie awake and 'normal', there is nothing left but to smooth out the rough edges. Supergirl gives Ellie another S-shield pendant as a gift. And Fred Danvers says that Linda will give Ellie a spot in her school to help her transition to her conscious life. Again, a nice touch from a Supergirl who wanted to do what was right for people. And I love the last panel, a joyous Supergirl whose batteries are recharged from her brief visit home and an odd look into her own past. So I will give Harris an A for effort in looking back at some Supergirl-specific historical details and trying to insert them into a new story. 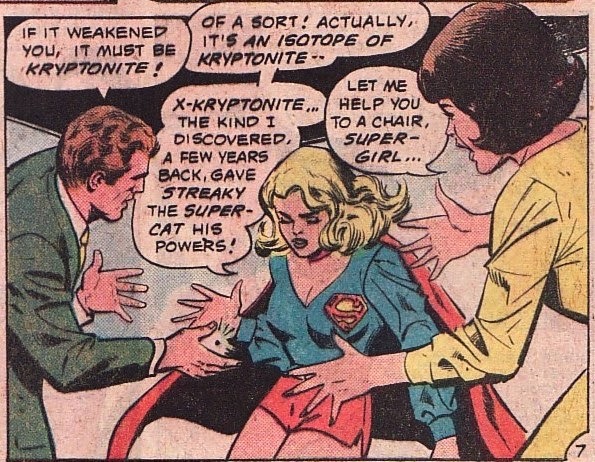 X-Kryptonite is a uniquely Supergirl piece of the Superman mythos. 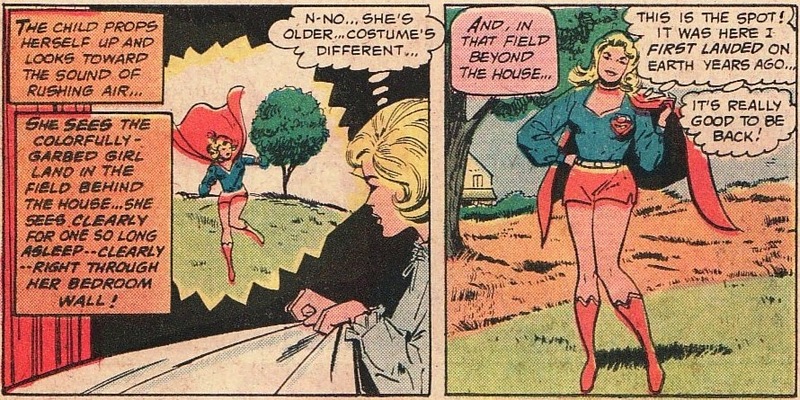 And the sight of a young blue-skirted Supergirl was a nice touch. Plus we learn Supergirl's crash date! But the details of the X-K are off and the Ellie story doesn't quite make sense. Why did she think she was Supergirl? Still ... A for effort. I don't have any major problem with Win Mortimer's art. I actually like his faces. Still nothing huge about this issue to make it crucial to a Supergirl fan. But the details are fun enough that I would label it of medium importance. I was a little let down when I heard that artist Yildiray Cinar was only on the Supergirl book for only four issues. That means we only get to see his great art on the book for only two more issues. That brings us just into the Red Daughter storyline. Still, I wonder if the Maid of Might has gotten into Cinar's blood a little bit. Or at least the ancillary characters in the book. 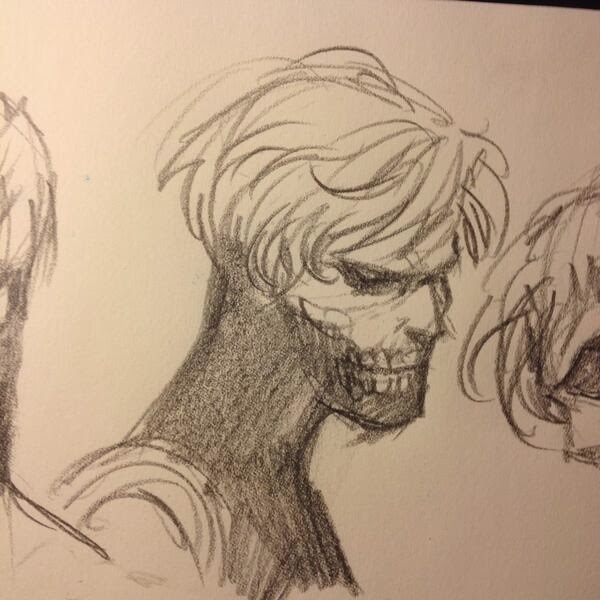 Over on Twitter, Cinar has posted some interesting character studies on the new Silver Banshee. I love this first one. You can feel her bracing herself as she cuts loose with her wail. And we only get a glimpse of some other looks at Siobhan. Here it looks like Cinar is getting a handle of her face from different angles and viewpoints. Wish we could see all of them. And then this look at the Banshee. Looks like she is rising or standing up. Just great stuff which makes me feel even lower that Cinar is leaving. 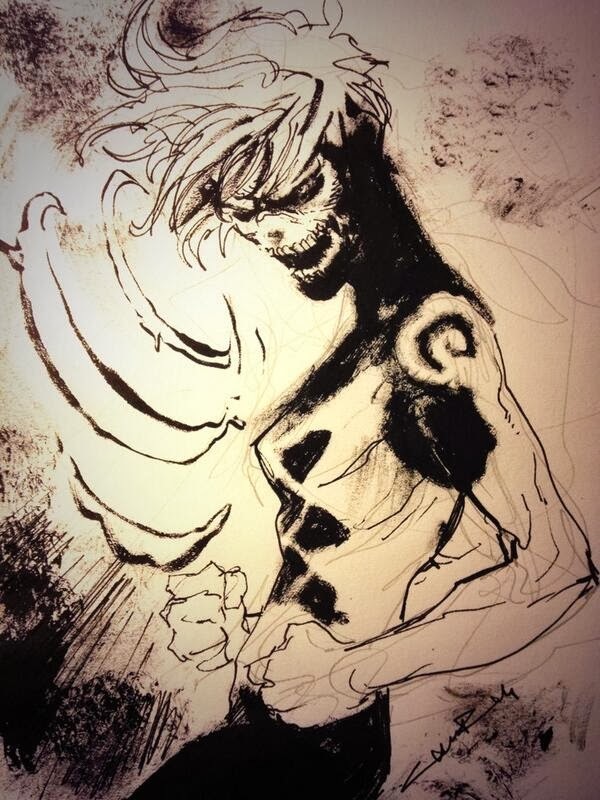 And kudos to Mahmud Asrar for designing this Banshee's look. http://www.yildiraycinar.net/ Definitely worth a peek. 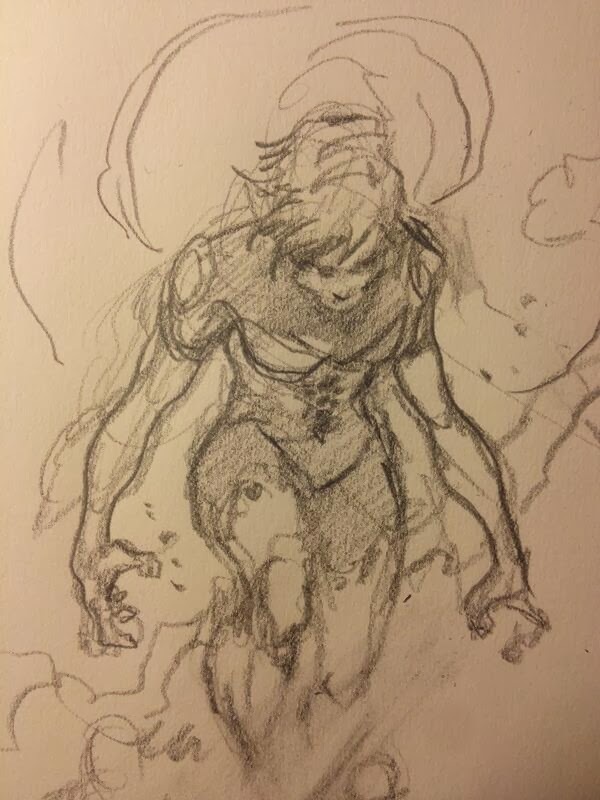 Looking forward to Cinar's issue with Siobhan! 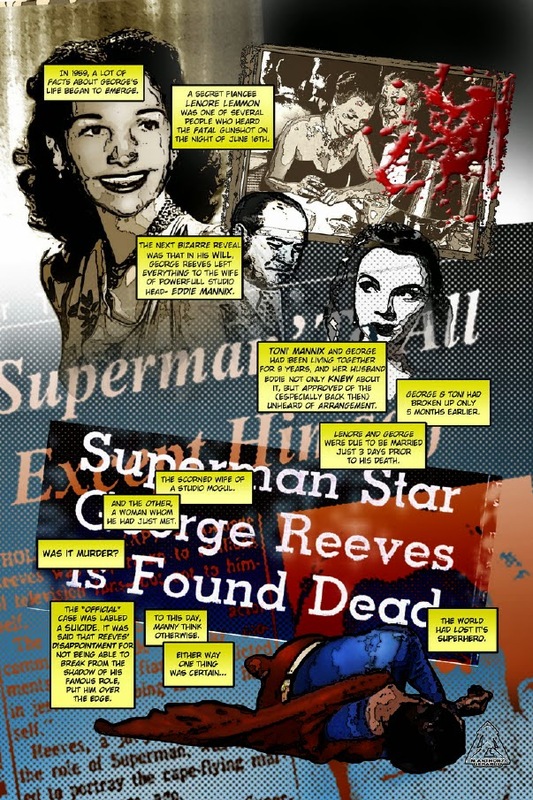 It was over a month ago that I reviewed the Blue Water Comics Christopher Reeve tribute comic. 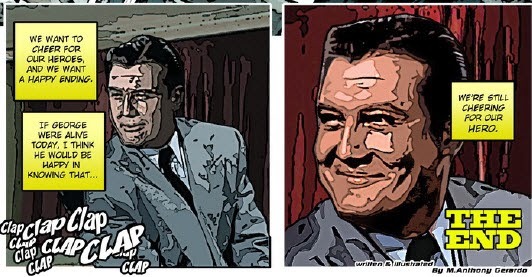 So I was happy when Blue Water decided to do a George Reeves comic. While the Reeve book was an inspirational tour de force, driven by Reeve's own words, this book is much more of a biography. And a quirky one as well. Reeves led an interesting life with ups and downs and darkness and mystery. 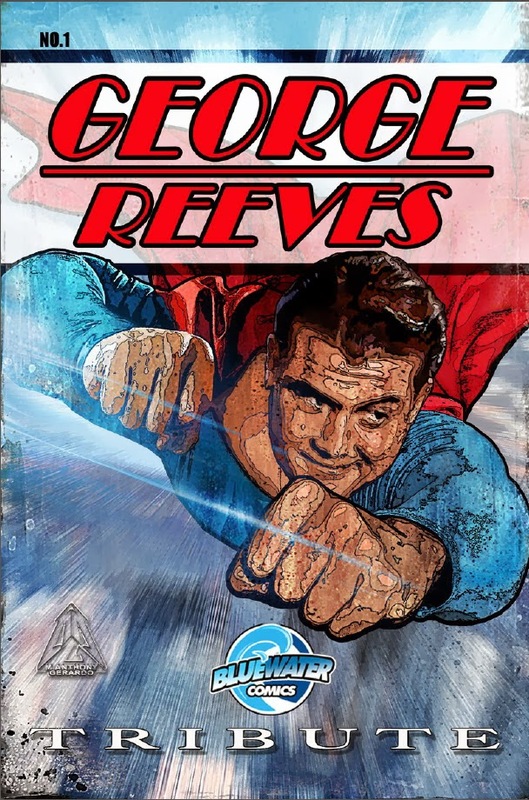 Written and drawn by M. Anthony Gerardo (who did art on the Christopher reeve book), the book has the flavor of a labor of love with not only the facts of the story but also interviews with people that have a more tangential link to Reeves. What I like about this story is that it not only covers the ups and downs of Reeves' movie career but also the ups and down of the Superman TV show. Lastly, while his suicide (murder?) might be the most salacious part of his life, Gerardo only covers it briefly, choosing to celebrate Reeves' life. Gerardo's art looks like it involves manipulating photos with computer effects. It gives this story an appropriate scratchy feeling, invoking the time period of grainy TV reception. There is just no getting around the fact that this book will be compared to the Reeve book. The Reeve book with its ethereal art and uplifting words made him bigger than life, iconic. 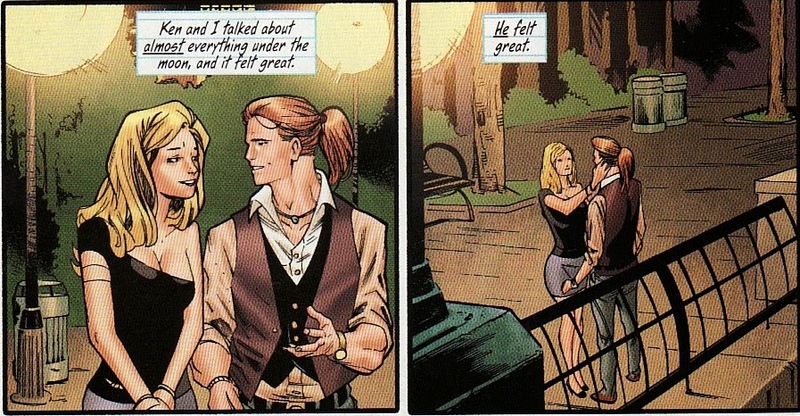 Here, as in these opening panels, Gerardo focuses on the more down to Earth life of Reeves. While he played Superman, he was just a man with the standard foibles. First we hear about the successes though. The sudden insertion of Reeves into everyone's home. The magic of television in those early days making him a superstar. 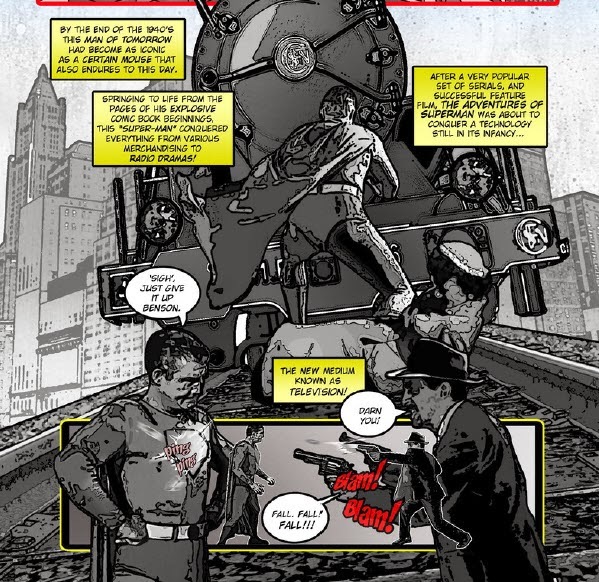 I love the top panel, a back shot of Reeve standing in front of a runaway train. More powerful than a locomotive? Yep. And coloring this page gray is wise, reminding me of the repeats of this show I used to watch as a kid. Traveling back, we get a slice of his early life, sepia toned for effect. Sounds like a decent enough life although divorce and remarriage was not that common back then. Kudos to Mr. Bessolo for adopting George. 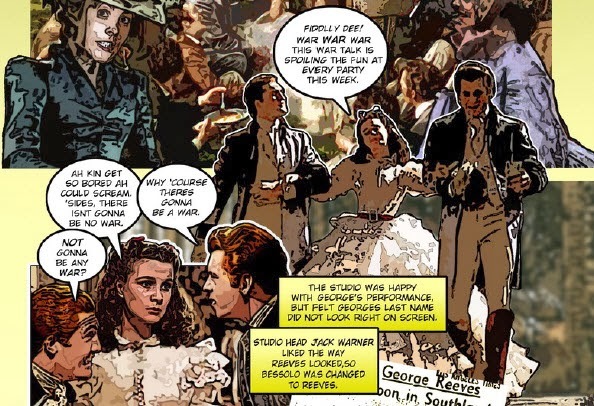 And then the early highlight of George's acting career, a small but speaking part in Gone With The Wind. Pretty amazing that Reeves has a couple of slices of Americana in his career. Superman is one. But does it get bigger than Gone with the Wind? There is this sort of 'what might have been' aspect to Reeves' career. While turning some heads and getting noticed by some Hollywood execs, WW2 interrupts things. Reeves' biggest proponent gets killed. As a result, Reeves is forced to star in some B-list (C-list) movies. 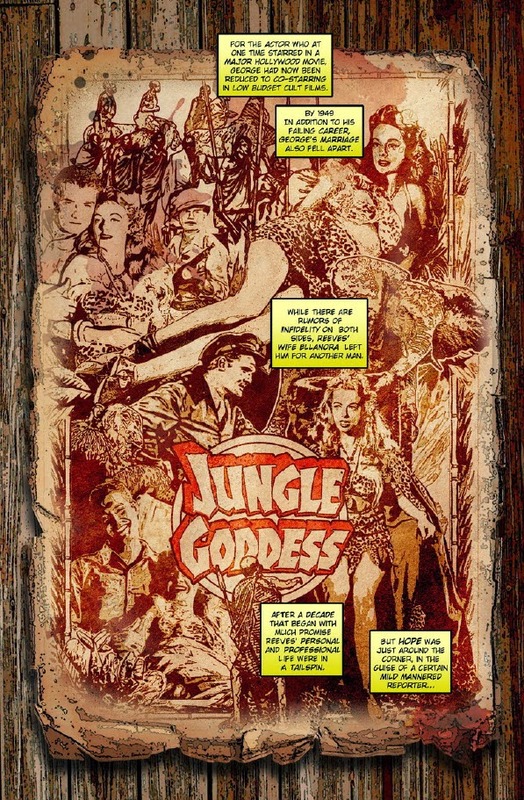 Jungle Goddess looks like a low budget treat. I knew nothing about this portion of Reeves' life so I am glad that Gerardo covers it. And I like this page construction - a mix of movie poster, lobby display, and movie clips. Luck would change when Superman came calling. I admit that it has been years since I have seen any of this show and even then it is remembered through the gauzy lens of my very early years. So Gerardo does grab my attention by talking about the more serious in tone early stories of the series, especially the 'prejudice' theme of the Mole Man movie. I do vividly remember being scared to pieces by the Mole Men as a kid. Only to have these more mature stories turned into flights of fancy on a show with a shrinking budget. Reeves life became consumed by Superman. He isn't the first actor to be defined by a role and to label it a curse. It is one thing to be a superstar in a show with reputable stories. It is another to be an actor one break away from legitimacy only to be forced into doing a cheap live cartoon. Still, I wonder how many struggling actors would trade places with Reeves on the set of Superman in a heartbeat. 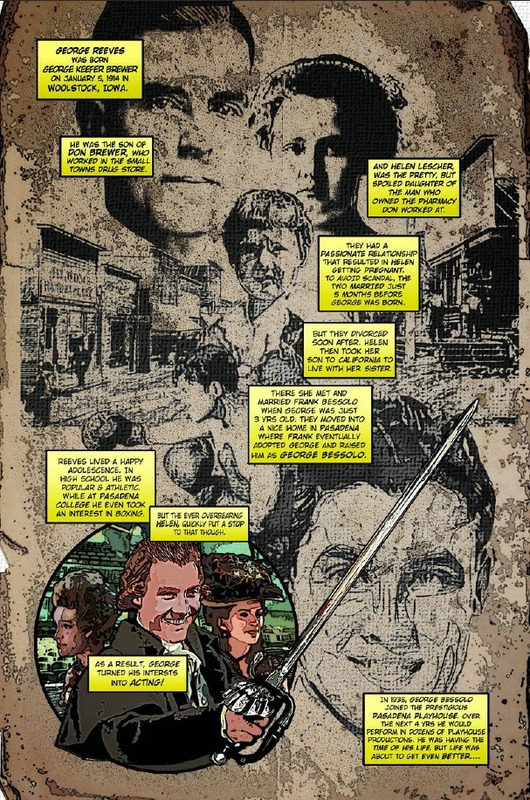 And then we get the page that delves into the details of Reeves' odd death. Affairs, gunshots, jealous husbands. It all sounds so sordid and again Gerardo is able to capture that with the page set up which looks like a montage of a crime movie in the 30s with floating headlines, blood stains, photos, and the dead body. But in the end, he is a hero. Whatever his personal life, Reeves was Superman for many. And Gerardo surmises, if alive, that Reeves would be happy with that. The rest of the book is fun as Gerardo inserts himself into the book doing the research. It is clear that he is a Reeves' fan which gives this issue a personal feel. If a Superman fan, especially of the TV show, this is a nice book to have with very compelling art. Is there a better feeling than stumbling on a diamond in the rough at the local comic book store? As I was walking around my store last week, I saw a stack of those old big over-sized tabloid style comics including the famous first edition giant reprints of Superman #1 and Flash Comics #1. 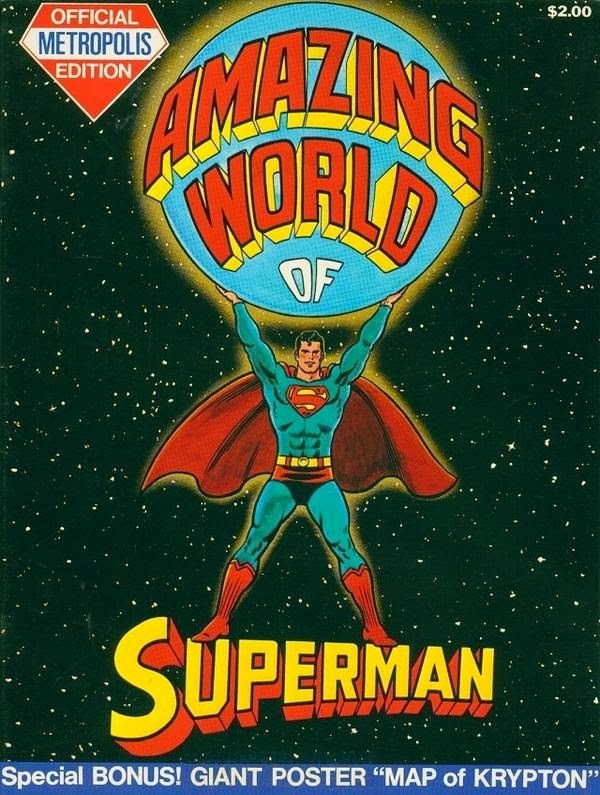 Nestled in that pile was this gem: Amazing World of Superman: Official Metropolis Edition, published in 1973. And after some finagling and with a sale going on I got it for $6. The book is in excellent condition and has, still stapled in the center intact, the giant poster of the map of Krypton. The one down side is that it is on newsprint and completely in black and white. 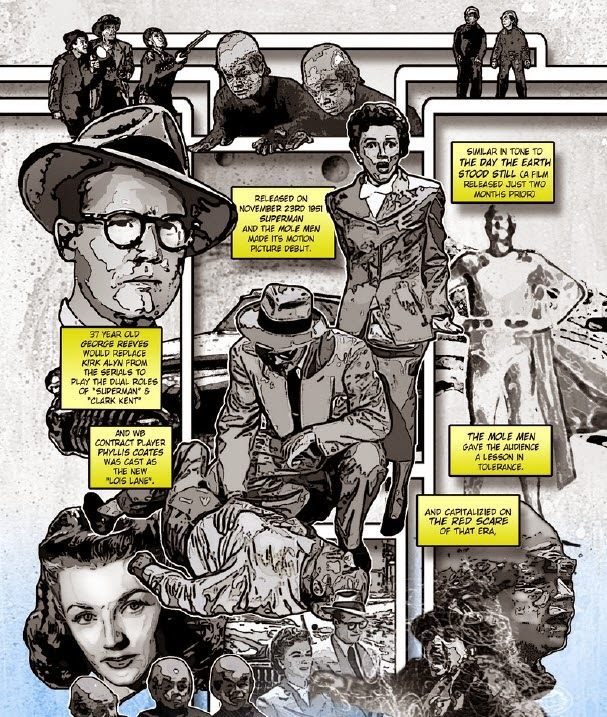 The book has two reprint stories, "Superman in Superman Land" from Action Comics #210 by Finger and Boring as well as "Superman's Mission for President Kennedy" from Superman #170 by Bridwell, Finger, and Plastino. It also includes a retelling of Superman's origin by Bridwell and Swan. These are fine old stories. And the Plastino one got some recent play when the art was found not to be at the JFK museum as originally thought. But it is the other stuff that is inside that brings me the most joy. 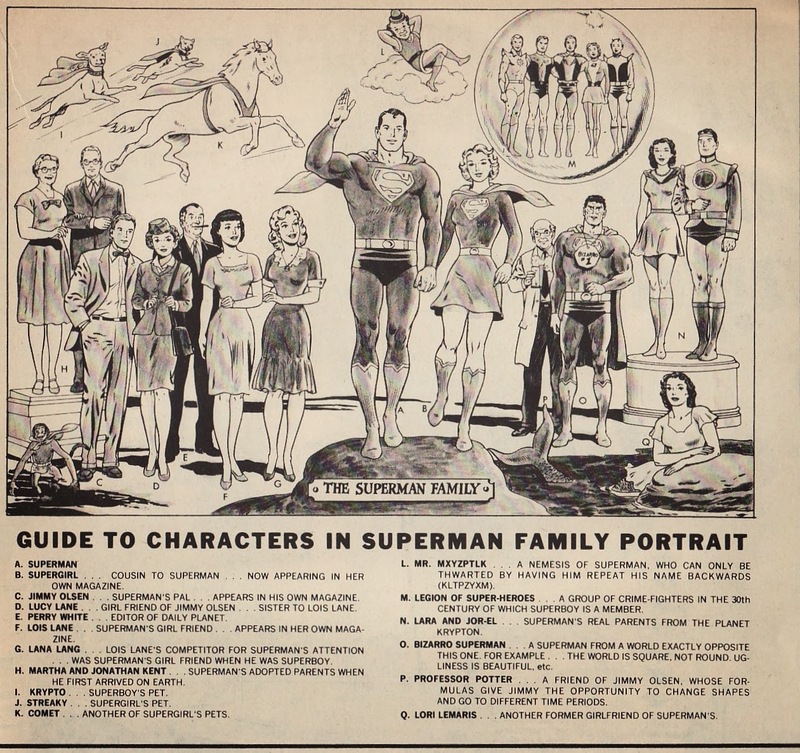 There are a lot of little pictures of Superman's family, his rogues, the presumed path of his rocket, and an article about making a comic. I will probably cover all these at some point. For now, here is the pic of Superman's Family. This must have already been produced and printed somewhere else. So if anyone knows where the original is from please let me know. The Superman Family includes everyone from his birth parents to the Kents to his Daily Planet supporting cast to the Legion to Lori Lemaris. It really is a nice little look at the biggest characters in the Superman books at that time. Poor Beppo is in the bottom left corner and doesn't get a name check. And interesting that Bizarro and Mr. Mxyzptlk somehow weren't considered villains and instead part of the family. But really what I love is that Supergirl is front and center in the family. She is right next to Superman and larger than life. I even like how they are holding hands like the loving family that they are. She really is the closest to living family Superman has so she should be so prominently displayed. Interesting how much times have changed. The art looks like Curt Swan's work. I am sure if I looked hard enough I could find this in color and where it was originally printed. But for now, this is what I own. Supergirl #27 came out this week, the second issue of the Tony Bedard era as writer and the last issue before the 'Red Daughter of Krypton' arc. Given that the next issue starts a new and controversial storyline, I thought that the Lobo story would be completely wrapped up by the end of this issue. Instead, Bedard has this issue end with a decent cliff-hanger, infuses some scenes to help the reader understand the slide into Red Lantern plot, and adds a lot of new plot hooks. While I know I don't agree with the idea of the Red Lantern arc, it might be a sort of catharsis for the character, literally and metaphorically burning away all the rage and angst in Supergirl since the inception of the New 52. And, now knowing it won't be some drawn out lengthy arc, I am suddenly a bit more accepting of the move. But setting that aside, Bedard really does a good job beefing up the book immediately. We learn a lot more about Shay Veritas, setting her up as a supporting character in the title. My spider-sense is still tingling about her. I still wonder if she'll end up a villain. And we re-introduce a classic Superman villain to the new 52 but setting her up as a Supergirl villain, a move that already seems so natural I don't know why it hasn't been done. Yildiray Cinar does the art here and bring a smooth clean sensibility to the book. It is a shame that he will only be on the book for four issues. 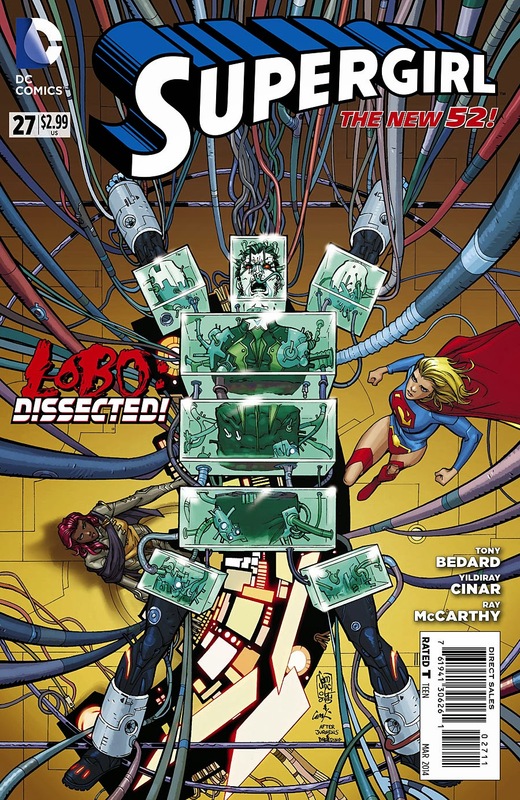 Last issue, Supergirl 'killed' the new Lobo when he attacked the Block. After the wicked right hook, Supergirl immediately felt remorse. It is one more brick in the wall of frustration Supergirl has been crashing against Supergirl #1. Bedard does a good job in this issue having Kara speak about her feelings. There is a hint that everything has piled up so high in her mind, in her soul, that she is simply reaching a breaking point. It makes sense for Supergirl to feel overwhelmed right now. This hasn't been an easy transition. So here, when she talks about simply losing control in the fight against Lobo ... everything going red ... implies she is simply losing control. This isn't the first Supergirl to have a crazy upheaval in her life. The others have all basically returned to the core of her character ... she wants to do what's right. Like Loeb and Kelly's version, this Supergirl has intentionally isolated herself, not leaving her any access to help dealing with her feelings. If you arrive alone and you make yourself isolated, of course you will feel overwhelmed. So I am hoping when this whole blows over, we get that likable Supergirl, the one who wants to help back. And I hope she takes a look in the mirror and realizes that she needs friends and family. That she can't do it alone. Here is one of those panels I love when words and art complement each other so well. First off, we get a sense of the enormity of the block. This place has to be a tesseract of some sort, bigger on the inside than it is from the outside. But moreover, Veritas' words about Supergirl being so strong in such a fragile world, 'walking on eggshells' invoked in me a feeling of claustrophobia, or delicacy in movement. And that feeling is contrasted with the space in this place. Kara should feel at home here, or a bit freer than she is on a crowded street. Anyways, I liked this panel a lot. And we finally get a bit more backstory about Veritas. 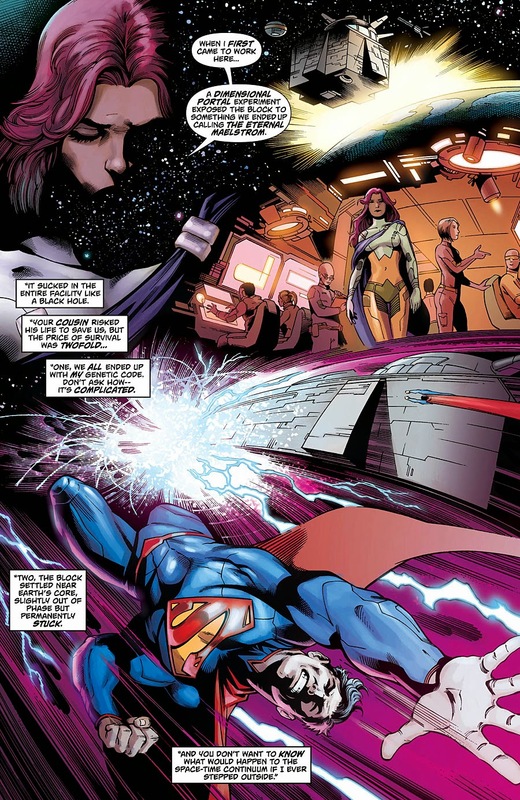 As hinted before, Superman saved the Block from some cosmic storm called the Eternal Maelstrom. But that save had any number of weird consequences. The Block is now out of phase with reality in the core of the Earth. All the other scientists - male and female - had their genetics rewritten with Veritas' genome. And everyone is trapped because leaving the block could cause a space/time rift. Odd. Her being trapped makes her sort of a technological Baron Winters, stuck forever in her 'mansion' without being able to leave, talking to 'agents' to do her outside work. Plus, there is this odd feel of impending villainy on her part. I don't know if she is evil. But I think she is so obsessed with what she is doing that I bet she doesn't care what happens to those in her wake. She seems so eager to study things that she doesn't think of the consequences. There is a sort of Luthor narcissism mixed with Brainiac thirst for knowledge. Veritas talks to Kara about seeking help from others and the response is ... no surprise ... anger. In the end, I think some of this is anger by Supergirl inwardly directed for putting herself in this situation but transferred to others. Supergirl derisively talks of Clark's 'duty and obligation', feelings drilled into his head. And then she yells about how Clark worked towards destroying Krypton again (in Krypton Returns) despite knowing that Krypton's existence was unraveling the universe. As I said above, I want Supergirl to see the best in people, to want to help people,and to learn lessons on how to do it right ... the hero on a journey. So this set of panels, flashing into anger over Kal who has done nothing but leave her alone as she requested, just seems off. I suppose it adds to why a Red Lantern ring would choose her. Again, I would be much more upset about this is the Red Lantern story had no apparent ending. This isn't Supergirl. Veritas offers to be Supergirl's friend. But I am so wary about her. That line read more like 'you can be my test subject' rather than an extended amicable hand. And here, Veritas talks about being interested in lots of things including extra-terrestrials. I am not convinced that all her science is done for the betterment of the world or humanity. There is something shady about this. Now I have really glossed over Lobo's part in this story because he is the least interesting part. It turns out he was faking his death, revives himself, and goes after Veritas. He takes out Supergirl with hypersonics, forcing Shay to run for her life through the Block. First Veritas turns on a 'fusion globe' to flash-burn Lobo. But then she runs into 'Xenocontainment Module 5'. Hmmm ... is this a prison? A zoo? Natural habitat for something she is studying? This looks like a Escher style labyrinth ... Hellish. And she asks whatever is housed here to help defend her. The tone of the conversation makes it sound like the being in this 'containment unit' is being held against its will. Again, the feel of malevolence under the shroud of 'advancing science' is strong. Veritas isn't a wholly good person. And maybe that is another brick in Kara's wall of anger. Even this person who seemingly wants to help her is really hoping to use her. And then we see who is being housed there ... Blaze. Blaze was the demon sister of Lord Satanus in Superman lore. A true denizen of Hell. Last time I saw her was in Reign In Hell. Surely she isn't being held in the Block willingly. Maybe the 'phase' of the place crosses dimensions? Either way, it furthers my thoughts of Veritas' character. I love Cinar's design of Blaze, huge, gangly, powerful, but with the classic helmet shrouding her face with huge horns. Perfect re-imagining. Lastly, this is such a perfect addition for Supergirl's rogues gallery I am surprised it hasn't been done before. It is a great idea. But Blaze doesn't need to get involved. Before Blaze can engage with Lobo, Supergirl, revitalized by the 'yellow fusion globe' that Veritas ignited, shows up and she is ... not surprisingly ... angry. 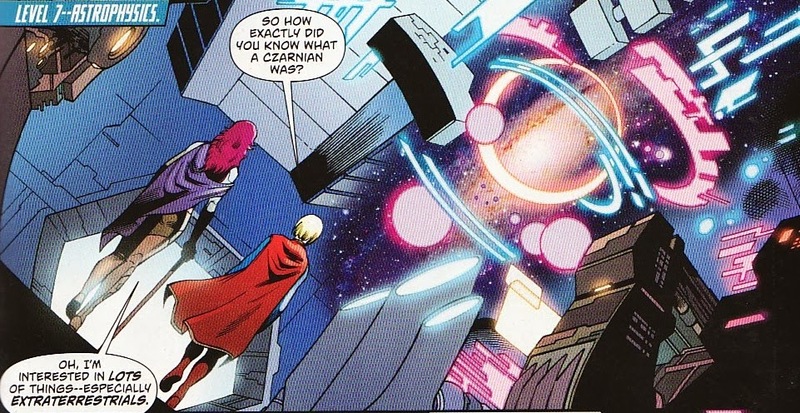 I suppose I should have guessed that the 'yellow fusion globe' would help Kara. Those words basically describe a yellow sun. 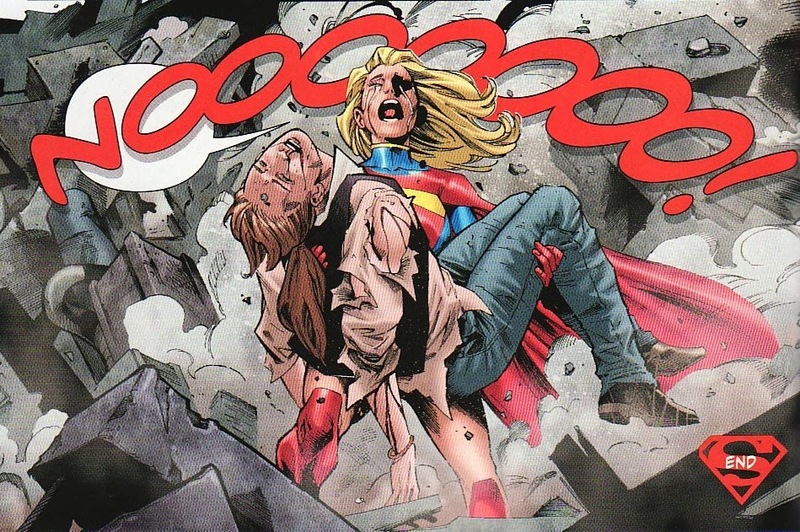 And, mega-charged, Supergirl talks about killing Lobo on purpose this time. Okay, there is no stopping this train. Supergirl is going to be a Red Lantern soon. And this story does its best to show just how much Kara has bottled up inside her. As I have said before, I am more easily able to deal with this stuff knowing that the Red Lantern arc seems to be relatively short. If we didn't know when Red Daughter was ending, if I didn't see a 'normal' Supergirl on the cover of the JLU, I probably would be wailing and gnashing my teeth. And with Blaze and Lobo and Veritas all still active at this cliff-hanger ending, we probably have to wrap things up here before she dons the ring. I wonder if the last page of next issue is the ring arriving. Despite the rage aspect of the story, there is so much to like in this issue. The increasing details of Veritas' life and her home make her more 3-dimensional. I think she is going to end up heading down the evil road. And Blaze is just an inspired addition to the Supergirl mythos. Add to those story elements Yildiray Cinar's beautiful art. 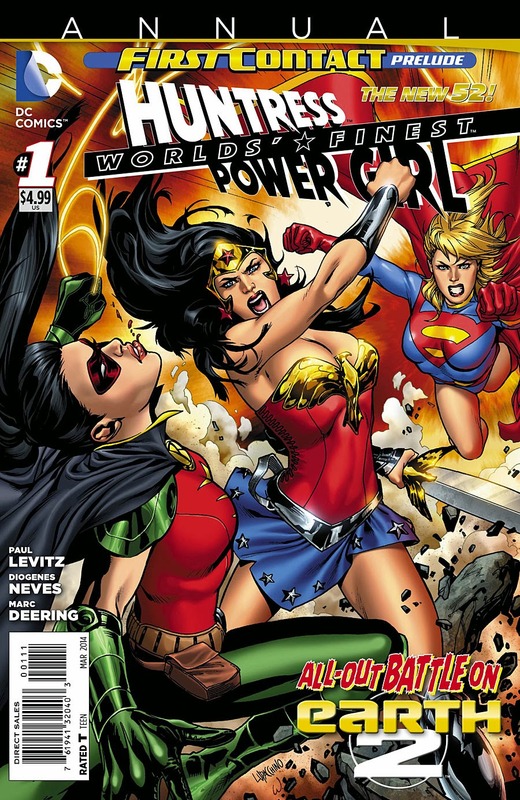 From the Blaze design, to the expressive nature of Supergirl, to this last power pose splash, this book is just great. And the perspective panel of the Block with tiny Supergirl and Veritas was slick. So we are moving towards a new Supergirl. Supergirl In Justice League United! Lobdell Off Superman?? JRJR on?